A Dearth Of Birds: West Nile Virus? Something very unusual happened this week at Hilton Pond Center, or perhaps we should say something DIDN'T occur. Despite our usual complement of ground and feeder traps baited with sunflower seeds and corn, we banded not one single bird during the period 22-30 November. Granted, we were gone from the Center for two days for Thanksgiving break AND had a few days of precipitation that precluded running mist nets, but the rain shouldn't have had any effect on birds entering traps--that is, unless there were no birds around to band, which certainly seems to be the case. We have no House Finches--historically our most common bird at Hilton Pond--and there are few Blue Jays, Northern Cardinals, or Eastern Towhees. Our usual winter influx of White-throated Sparrows, Dark-eyed Juncos, American Goldfinches, Yellow-rumped Warblers, and Purple Finches has yet to materialize, although the latter do show up as late as January. 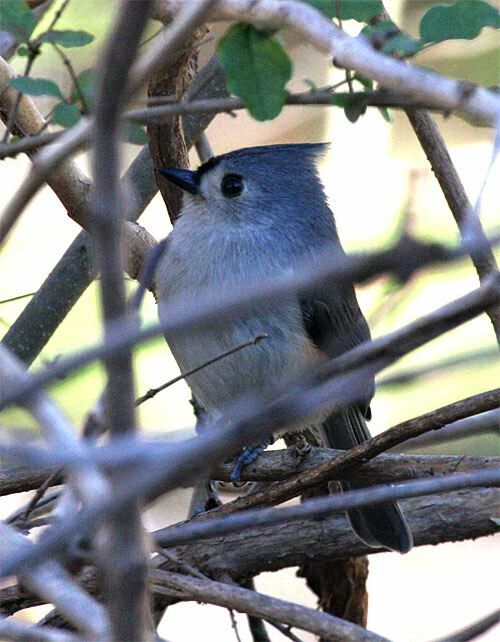 It's not uncommon for a slump in feeder activity around the end of November--or for occasional delays in the arrival of winter migrants--but right now the only birds coming to our feeders with any regularity are a handful of Carolina Chickadees and Tufted Titmice (below); there's no doubt we're experiencing one of the greatest drop-offs in bird density we've experienced in our 24 years autumns at Hilton Pond--a decline that gives us considerable concern. The density of bird populations at any site is always in flux, with any of a number of factors influencing how many birds are present from season to season and year to year. 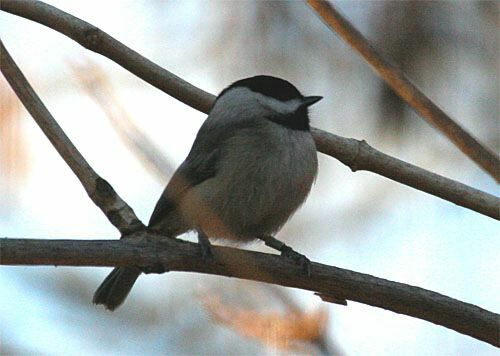 For example, a sudden weather change in spring can wipe out early nesting attempts, while loss of habitat due to natural calamity such as fire or windstorm can displace local birds on either breeding or wintering grounds. Tropical storms may interfere with migration and cause long-distance migrants to fall short of their destinations; who knows what effect this year's glut of hurricanes may have on resident and migrant birds? In addition to these various weather-related factors, predators can increase in number and decimate birds they prey upon, or epidemic disease may strike a particular bird species and reduce its numbers almost instantaneously. All these natural causes of bird declines have been in place as long as there have been birds, and it stands to reason that when more than one of them comes into play there might be an unusually big dip in the number of birds present in a given year. If we add factors such as global warming and habitat destruction accelerated by humans, the natural balance is tipped so that it becomes increasingly difficult for birds to rebound from cyclic population declines. We're not sure what the problem is here at Hilton Pond, but our observations indicate that this fall's dearth of birds is real and not imagined--and that some "unusual" factor or combination of factors might be the cause. We don't think our local habitat change is at fault for the current decline in bird life. True, the Center's 11 acres has changed significantly since 1982 due to natural succession, with the original grassy expanse of Broomsedge being replaced first by shrubs and eventually by the young mixed forest of pines and hardwoods that now prevails. 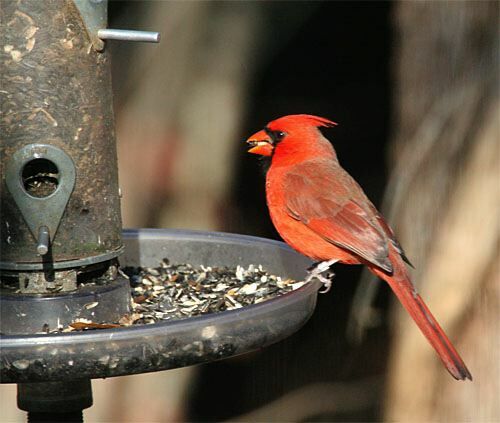 Shrub-loving species such as cardinals have declined since our early days at the Center, but until this fall we've always had at least a dozen or more redbirds visiting our feeders regularly in all seasons. 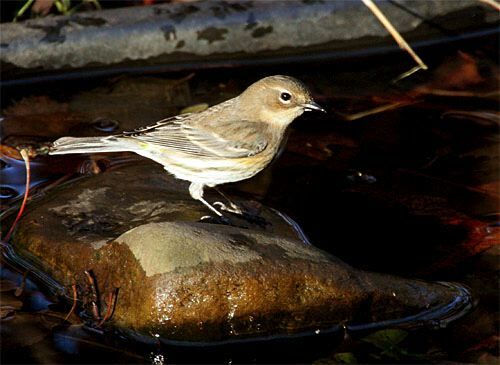 There's always the possibility that habitat destruction near Hilton Pond Center or on more northerly breeding grounds of winter residents such as sparrows and juncos has reduced our local populations. Most House Finches and Purple Finches we have banded locally that were then retrapped or found dead elsewhere during the breeding season were in a narrow corridor that stretches from York SC to Philadelphia to New England and Canada. Could it be loss of habitat along that migratory path has resulted in fewer birds at Hilton Pond this autumn? And how about predators? Some years at the Center we end up with a Sharp-shinned Hawk lurking all winter around the feeders, a scenario that results in the daily loss of a songbird or two. We had a Cooper's Hawk pass through about a month ago, but even our resident Red-shouldered Hawks that occasionally may take a smaller bird haven't been seen regularly. Perhaps the absence of these raptorial species is the result--rather than the cause--of our local songbird decline. So if it's not predators, lack of food, or local habitat loss, what might be causing our dearth of birds this year? As much as we hate to think about it, we fear the cause may be disease. Not the conjunctivitis that affects House Finches, or salmonella that might be enhanced by feeders if we didn't work hard to keep them clean, but the dreaded WNV--West Nile Virus--a disease transmitted by mosquitoes to birds and occasionally to humans. West Nile Virus arose in the Old World and somehow made it to the Western Hemisphere. We suspect it has been in North America longer than people realize, but only in the past six years has it has been observed in U.S. bird populations. The disease was first detected in the summer of 1999 in a dead crow at New York's Bronx Zoo; since then it has been found in more than 150 native bird species--even Ruby-throated Hummingbirds!--and has spread to all 48 contiguous states, seven Canadian provinces, eastern Mexico, plus Belize, El Salvador, Puerto Rico, Dominican Republic, Jamaica, Guadeloupe, Trinidad, and Cuba. More than 15,000 U.S. residents have tested positive for WNV and at least 500 of them have died--mostly elderly folks or those with suppressed immune systems. The Centers for Disease Control and Prevention (CDC) reports that about one in 150 people develop severe symptoms including high fever, headache, neck stiffness, stupor, disorientation, coma, tremors, convulsions, muscle weakness, vision loss, numbness and paralysis; such symptoms may last several weeks, and neurological effects may be permanent. Up to 20% demonstrate these symptoms to a milder degree and/or develop swollen lymph glands and torso rashes, but almost 80% show no symptoms at all. We suspect many field biologists have survived the disease after passing it off as a cold or runny nose--a better fate than that suffered by increasing numbers of wild birds that succumb to WNV. The best way to protect against West Nile Virus, of course, is NOT to get rid of birds such as Yellow-rumped Warblers (above) or Carolina Chickadees (below), but to avoid getting bitten by mosquitoes. Although we humans can accomplish this goal, going unbitten is beyond the capability of wild birds. We suspect a bird sleeping all night on an outdoor perch is a prime target for a blood-thirsty WNV-carrying mosquito, and there's not much the bird can do to avoid being bitten. If a bird inoculated by the virus makes it through the first four days or so, it likely will survive the viral onslaught in its blood and develop a permanent immunity to WNV, which also seems to happen in humans. Nonetheless, innumerable birds do succumb to West Nile Virus, and we fear the fast-spreading WNV epidemic may indeed be diminishing our bird populations at Hilton Pond Center. On the other hand, this fall's near-absence of bird life may simply be a low point in some natural cycle. No matter whether West Nile Virus or some other mix of factors is the cause of our current dearth of birds, we still have great concern the balance of nature may be teetering on the edge of major, cataclysmic change. There's little doubt this change is accelerated each day by Homo sapiens, whose scientific name seems oddly oxymoronic when we consider how members of the species have used their "big brains" to invent so many ways to assault wild birds and the environment. Wonder if we'll ever really wise up? --Nearly 1.2" of rain this week at Hilton Pond Center helped cut the dust and bring some much-need moisture to the roots of trees and shrubs as they ready themselves for the dormancy of winter. --Considering the near-absence of birds at the Center, we were surprised on several days this week to see a perky Gray Catbird flitting about in a Forsythia thicket outside our office. Although this species occasionally overwinters in the Carolina Piedmont, we seldom have one this late in the year. --A Great Blue Heron and a male Belted Kingfisher are two other species we see almost daily around Hilton Pond. Both are doing their part to keep the local fish population in check.